Organizational Skills — Appellate work revolves heavily around a paper record created in a trial court. This record frequently is composed of thousands of pages of trial transcripts, motion papers, briefs, and trial exhibits. The trial file will also have other materials that were not used at trial, but still contain important information about the case on appeal. Obtaining these materials takes time and effort. Keeping them organized so that they are available when needed for use in connection with the case is central to an efficient and successful appeal. This does not sound important, until and unless one realizes that the failure to obtain and review all of the necessary documents could prevent the attorney from developing a full understanding of the record, with the result that viable appellate arguments may be unknowingly omitted from the appeal. Analytical Skills — An appellate attorney must be able to review the entire appellate record with an eye toward isolating those portions that reflect trial errors that can be the basis for appellate arguments. This involves well-honed analytical skills, knowledge of the applicable law, and good judgment. Research Skills — Many people think that attorneys simply know automatically the correct answers to every legal question. Nothing could be further from the truth. In fact, most attorneys will know the answers only to basic or common legal questions. Most legal issues cannot (and should not) be addressed without careful research and thought. A good appellate attorney will know how to locate the correct answer in the many hard copy and online sources of legal information. Writing Skills — The first, and sometimes only, presentation of appellate arguments is made in appellate briefs. Briefs must be written clearly and logically so as to convey forcefully the client’s position on each issue, while complying with all applicable court rules. Good briefs marshal the evidence presented at trial in the light most favorable to the appellant, and contain citations to all of the applicable law and other supporting sources. Verbal/Public Speaking Skills — Advocating for the client does not necessarily end when the last brief is filed. 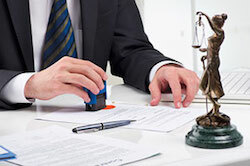 The attorney must be able to present a client’s position orally to a panel of appellate judges, as well as respond to questions concerning his or her positions. To the extent the opportunity presents itself, the attorney must also be able to respond effectively to arguments raised by their adversary.